Type Bee says “Boo!” Not as a crowd boos a performance, but to startle or frighten you. Yes! It’s almost Halloween—time for ghouls, skeletons, and terrifying pumpkinheads. Be afraid, be very afraid. Last year at this time I had the great pleasure of being in Salt Lake City. Every year, the City of Murray hosts a family-oriented jaunt through “haunted” Murray Park, one of David Archuleta’s favorite local haunts. Survivors receive hot chocolate and doughnuts. If you live nearby or plan to visit between October 26th and 28th, you may purchase tickets at the concessions stand near Murray Park Pavilion #5. (Phone 801.264.2614 for more info.) 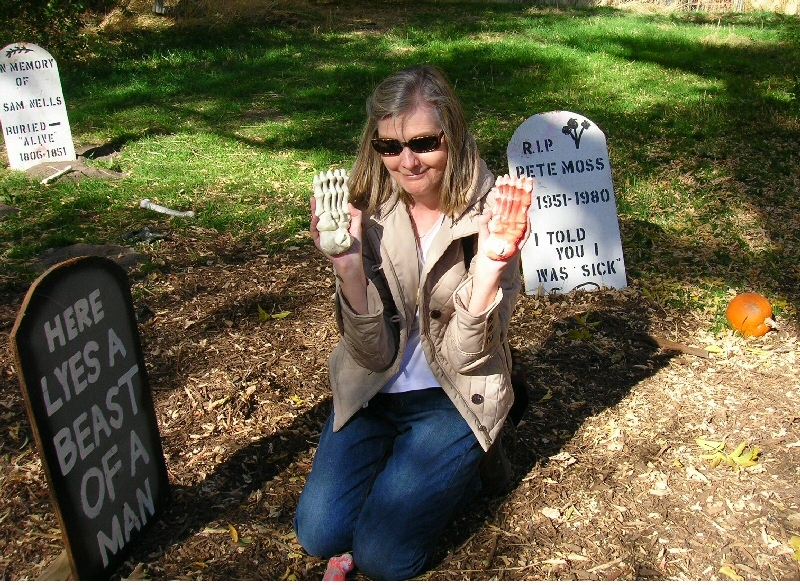 This photo is of me having a little macabre fun at the “graveyard,” where gravestones bore funny epitaphs. Click to enlarge if you dare. Warning: I’m a fright! On a side note: did you know? The main colors of Halloween, orange and black, are also the school colors of Murray High School, which David Archuleta attended. In Scotland and parts of northern England, trick-or-treating is called ‘guising,’ a practice dating to the Middle Ages. The word comes from the disguises or costumes worn by the children. Children must earn their treats by performing. They might sing, tell a ghost story, or recite a funny poem. 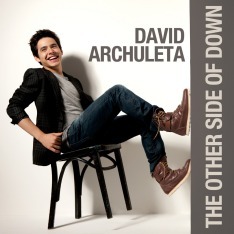 If David Archuleta went guising in his neighborhood, he would receive the most treats, because there is no disguising his exceptional vocal talent. A dark cave. In the middle, a boiling cauldron. Thunder. Enter the three Witches. Witch 2: Thrice and once the hedge-pig whin’d. Witch 3: Harpier cries ’tis time, ’tis time. If you have memorized this poem, haha!, you can read last week’s “Type Bee”. Order yours today on Amazon.com! Ok Minna, You just made me afraid! The wind is whistling through the trees this evening making the leaves crackle up against the fence. 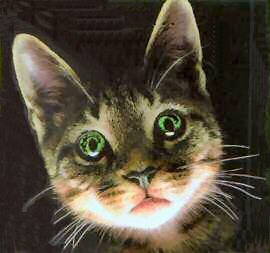 Howling now is coming from cats on the fence looking for shelter. Do I have my days mixed up! Saturday is Halloween! All I need now is some Witches Brew! Ooooooo! Where are the trick or treaters!!! Wonderful Card… perfect for the occasion. But, with my David’s Christmas songs playing in the background I want it to be Christmas already! I heard it through the grapevine – or perhaps from a buzzing bee – that the witching hour is fast approaching! An interesting thing to note about the famous scene with the witches in Macbeth is that many scholars believe it was inserted into the play at a later date and was not written by Shakespeare. They arrive at this conclusion because the language used and the style of writing doesn’t fit with the rest of the play or with Shakespeare’s writing in general. Just think of the line from the following children’s song: One of these things is not like the others, one of these things just doesn’t belong!